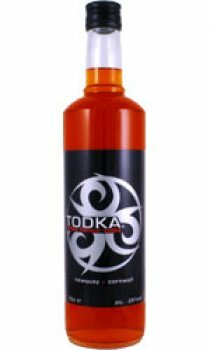 Todka is a deliciously smooth, toffee flavoured Vodka, first discovered in the ski resorts of the French Alps. Nigella Lawson included Todka in her Espresso Martini recipe in The Nigella Christmas book, saying: "I love the Toffee Vodka made in Newquay Cornwall called compellingly - Todka"
As a shooter, over ice or in cocktails. In a refreshing drink with the mixer of your choice. Over ice cream. To create magnificent deserts. With coffee. Had a drink of Toffee Vodka at a party in the summer and loved it so found TODKA - Toffee Vodka from TheDrinkShop.com and thought we would give it a try in the hope that it would be just as nice... We were not disappointed, it is absolutely delicious. I am now ordering 4 more bottles (2 for us) and the others for friend + family who have also become hooked on it. First tried this a couple of years ago after buying a bottle at the Eden Project (and having a very merry evening camping despite the awful weather lol!! ), went back to Cornwall this year and found they now make 2 new flavours - banoffee and hazelnut, both of which are as delicious as the original flavour, yum yum! I first brought this from the Eden Project after trying a sample. Must admit, to start with I only brought the bottle as I thought the cashier was cute. But after walking around the gardens in the sun with this bottle in a lovely brown paper bag, drinking neat from the bottle. One of the best memories I have. Very smooth and easy to drink too much. Awesome. Warning this stuff is addictive, its just so lovely. One bottle for a friend from the Eden project has led to us buying by the case. Everyone who tries it wants more, were scared to tell anyone else in case there's a shortage. Shouldn't have posted this but its just amazing. This is a fantastic very moreish drink found it on holiday in Newquay, we have since introduced it into our local Pub. It is selling like hotcakes, I had twenty Four bottles delivered at the beginning of December only four are now left so got to order more. Would highly recommend this drink to anyone, we are now making Banana ice cream with a large amount of Todka in it, FANTASTIC taste. Me and my boyfriend were given this stuff by a waiter to try and we couldn't find it for ages! It is soooo good! Mmmmmmm Yummy. Please Sir, can I have some more! This stuff is so very delicious. So glad went to the Eden Project and found this. This is so delicious and I dont like vodka. We now stock it at The Railway Hotel in Blandford Forum Dorset. Oh yum, yum. More, please! This stuff is sooooo delicious, it shouldn't be allowed. My parents (who live in Cornwall) and I are all hooked, and buy some whenever we are at Eden. Wish it was available more widely. Cornwall's a long way to go from Salisbury! This stuff is fantastic, so glad we went to the Eden Project and discovered it. Brilliant for post dinner drinks. I just love Todka, it is so lush! I cant get enough of it and I was so sad that I had to buy a bottle to come home with when we was down in cornwall last week. Tried this drink a few years ago after being lucky enough to win a bottle at the Riviera Run in fabulous Newquay....Wow what a great taste. After visiting the Riv Run again this year was over the moon to find they were selling shots, and I didnt even have to get out of my seat, well done TODKA TEAM, it certainly livened up the night. HAVE NEVER TASTED ANYTHING QUITE LIKE IT EVER. A must for any party, just make sure you have enough bottles!!!!! Toffee and Vodka? It didn't seem like an obvious combination when a friend handed me a Todka shot over ice. A surprisingly smooth taste which I discovered is equally good as a mix. I expected it to be too sweet but the makers of Todka have managed a subtle balance between the Vodka and Toffee flavour. And a nice kick too! Thank you Todka for giving me a card up my sleeve at dinner parties and barbecues. Everyone is eager to try it and the converted are demanding refills! A worthy addition to my drinks cabinet. Tried it last weekend in a bar in Newquay, very smooth and tasty - a real treat. Will definitely be having some more! Have tried other toffee vodkas and much prefer this one.